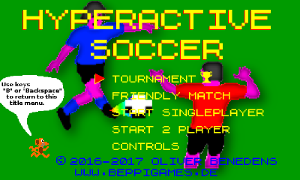 A fast-paced 5-a-side soccer game with challenging CPU opponent, 2 player mode (only in HTML5 version) and several singleplayer modes. 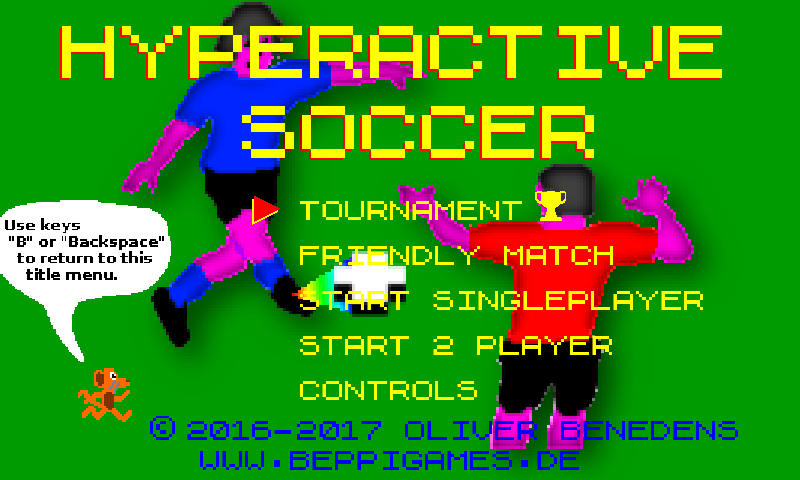 Hyperactive Soccer 2 is the successor of this game and features much improved gameplay. View this first one as intermediate result. Requires Android version >= 2.3. 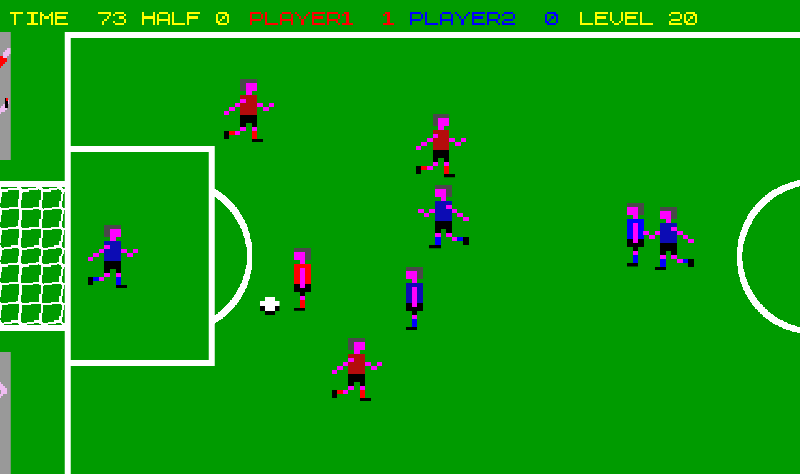 The android version does not include a 2 player mode. There is touch support but its difficult as hell (but works nice for me :-)). Use keyboard or gamepad. If browser does not support the Gamepad API you have to resort to keyboard (best control option anyway). E.g. Pale Moon does not. I wonder if gamepad support activated by default in the game is even counterproductive. E.g. users may prefer to map gamepad to key events by means of external tools. 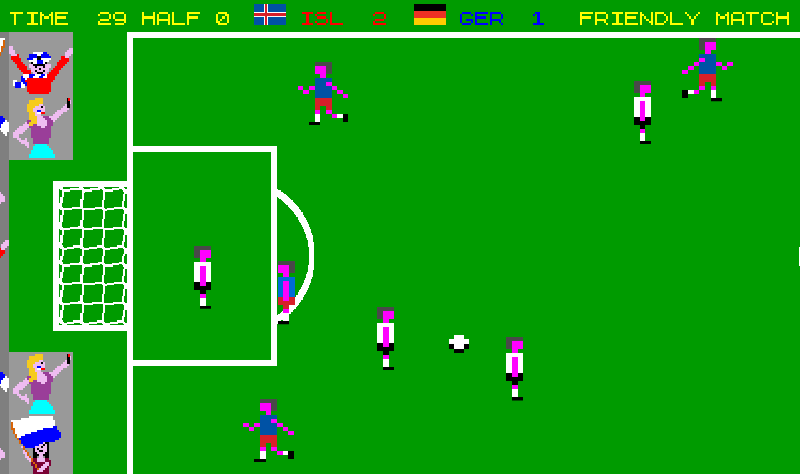 You play a game of 5-a-side-soccer either in singleplayer or 2 player mode for 2x90 seconds. 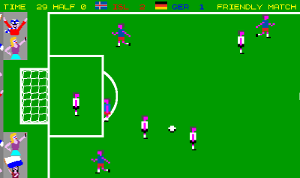 The author was influenced by International Soccer (C64) and RealSports Soccer (VCS 2600). 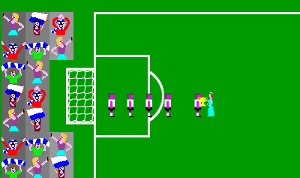 The celebrations in the game are a homage to International Soccer. 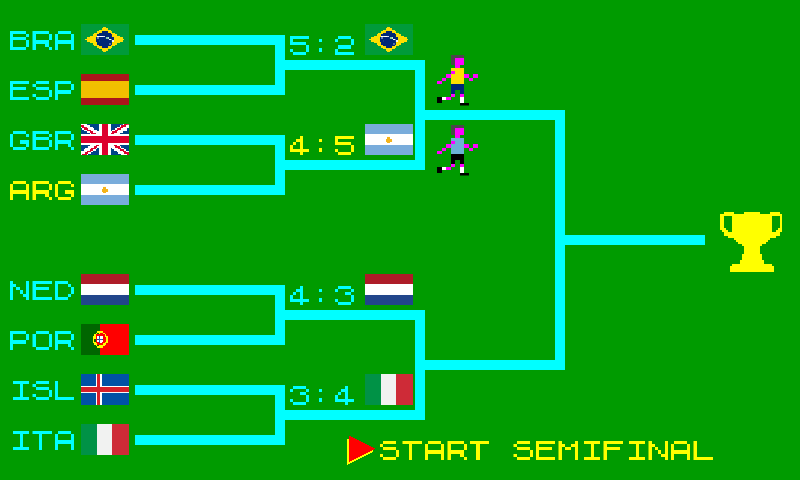 Tournament: You select one of 5 game speed levels, then one of 16 nations and play a tournament against CPU teams, starting in quarterfinal. If you win three games in succession, you win the tournament and celebrations follow. Note that a draw counts as defeat as there is no penalty shootout. Friendly match: You select one of 5 game speed levels, then your and the opponent nation and play a match against the CPU. Singleplayer: You play a match against the CPU. 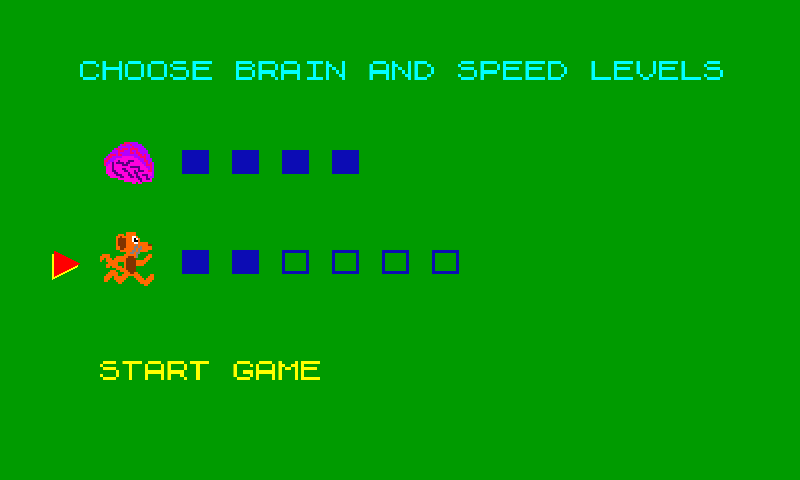 In this mode you select brain and speed levels which are applied to both teams (explanations below). 2 player: You play a match against another human in local multiplayer. Use two joysticks for this. As in singleplayer you select brain and speed levels. The brain level means the rate at which the CPU (opponent and user supporting) makes its decisions. The speed level means the running and shot speed. There are 4 brain levels and 6 speed levels, meaning, you have 24 different levels to play with. If you play with nations (tournament and friendly match), brain and speed levels are depending on the nation. You will be asked to select one of five speed levels, ranging from "fast" to "incredibly slow". Depending on the selection the speed will be scaled down but in a way that speed differences between teams are preserved. The brain levels associated with the teams are not modified. For each function a list of comma separated alternatives is given. 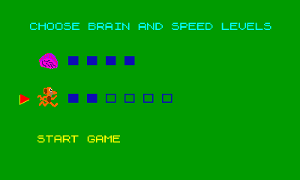 The brain and speed levels are adjusted with left/right movement/arrow keys. Pick your favorite controls from these alternatives. Regarding gamepads there are no configurations necessary. Just plug in one or two gamepads. If problems reload the game in browser or connect gamepads before loading the game page. Only Player1 (with Joystick1 or his keyset) can navigate/select in menus. This avoids confusion between players. When playing with two gamepads the keyboard is only required when wanting to abort a game (with B or Backspace). Note that Joystick1 Button1 functions both for shooting and selection in menus. Technically, all analog and digital sticks on a gamepad should be usable. However there may be browser/OS(?) bugs which result in e.g. only the first analog stick usable or a stick being unusable because of having wrong interpretation of axes. Notice that for Shooting only Button1 on a gamepad is supported. In singleplayer both the controls of Player1 and Player2 work. As you see there are alternatives. With keyboard I use arrow keys and X. A left handed player might prefer WASD and L.
There are 8 movement directions. For diagonal movement you press two keys: Up or down AND left or right. Tested with bluetooth and USB-OTG connected keyboard. The game uses the first pad found, first three buttons are mapped to shoot, next and back. Tested with USB-OTG connected Logitech Precision pad and XBOX 360 wireless controller. Also tested with gamephone bluetooth controller in HID mode. Touch is difficult as hell (but works nice for me :-)). Avoid it. This is a game for keyboard. That being said, move by touch and drag in left screen half, shoot by touch in right screen half. If onscreen controls are active and visible can be toggled with "CONTROLS" option in the CONTROLS menu. You may want to turn them off when playing with joystick or keyboard. 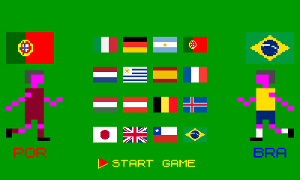 In the same menu the size of the controls can be selected (NORMAL or SMALL). SMALL should be only required if playing on a 10" inch touch screen or larger. In same menu the sensitivity of the onscreen controls can be set to one of five levels: This (simplified) corresponds to the amount of distance to move the virtual joystick to be registered as a new direction. For a low level keeping a running direction is easier while a high level allows for quicker direction changes. The default (3) should work best. Tested the game on touch-screens of size 3" to 10". The game was developed in 100% C++ and OpenGL ES 2 (emulation) on Linux and transpiled to html5 utilizing the amazing emscripten. 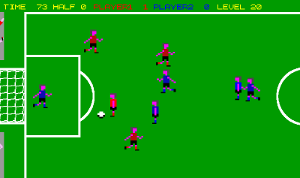 The motivation for creating the game was to develop the CPU opponent. 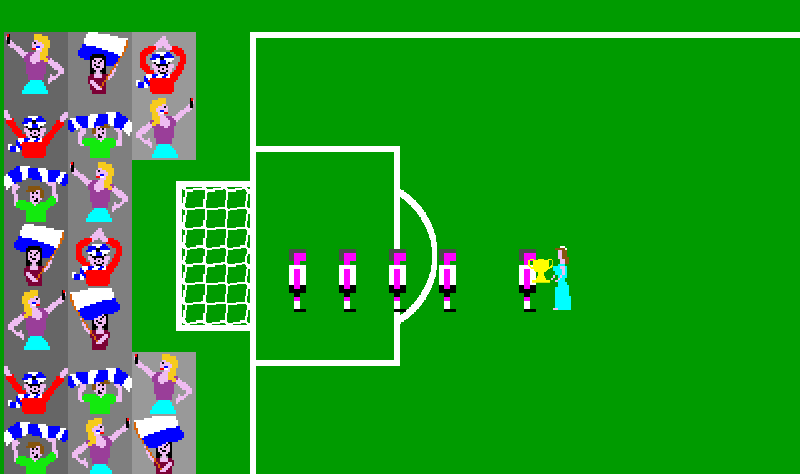 This game expects your goalkeeper to leave his goal for sweeps. He can even score goals but beware the CPU opponent will seek to exploit an unoccupied goal. 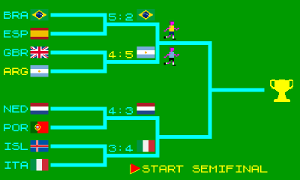 Easter egg: In Tournament mode, on the tournament tree page, press the up key (or move joystick up) 5 times and the tournament is won and celebrations start. In the android version touch the trophy five times. Note on Android versions: The game evolved: It started with three difficulty levels, only one single player mode and a short playfield. 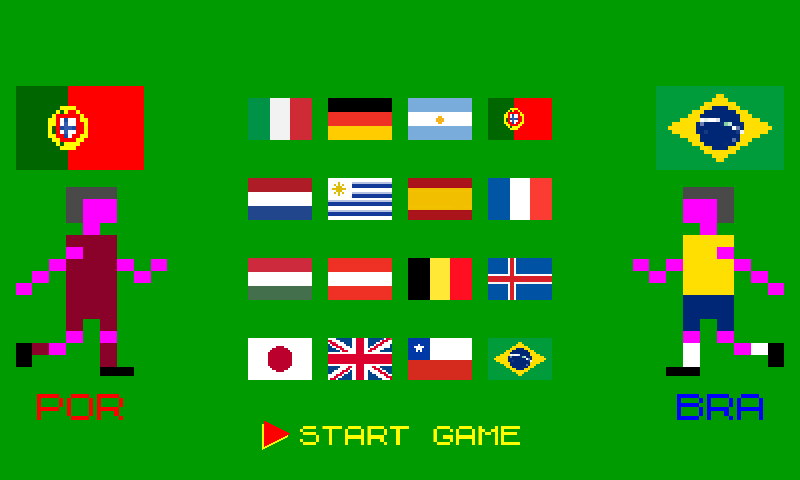 The most recent version, named DX, has nations, tournament mode, friendly matches etc. There were versions 1.0 (oldest), 1.1, 1.2, 1.3 and DX (newest) in existance. You find DX on this site. 1.3 has much less features. 1.2 and prior have an endless loop in them so avoid those. I have no control over what versions are floating elsewhere on the net.